The ASO blood test checks the ASO titer blood level. What is an ASO test? The ASO blood test measures the ASO titer level. Why is an ASO blood test important? ASO testing can help identify a streptococcal infection. This ASO Blood Test is a blood test. The ASO blood test, also known as an ASO titer, ASO test, ASLO lab test and antistreptolysin O antibody titer, measures the ASO blood antibody blood levels. ASO, or antistreptolysin O, represents a class of antibodies produced by the immune system. ASO antibodies are formed to protect the body against a group A streptococcus bacteria infection and sometimes against group C and G bacteria when an infection is present. The presence of ASO blood antibodies suggest an infection and should be correlated to actual symptoms as some people with positive ASO tests have no symptoms. The ASO blood test is considered sensitive for most streptococcal infections (not streptococcal pyoderma). ASO antibody levels rise approximately seven days after an infection and peak over the following three weeks. ASO blood levels typically disappear within twelve months if a recurrent infection does not take place. The ASO blood test is positive in the majority of cases of acute rheumatic fever and also glomerulonephritis in the kidney from streptococci. It is also used in attempting to diagnosis scarlet fever. The streptolysin-O antibody titer can be falsely elevated in the setting of liver disease and concurrent infections with B. cereus or Pseudomonas. Getting an ASO test near you is a straightforward process. Simply order online and get tested at the Quest Diagnostics lab that you selected. Once your ASO lab results are ready, they will be available for download. 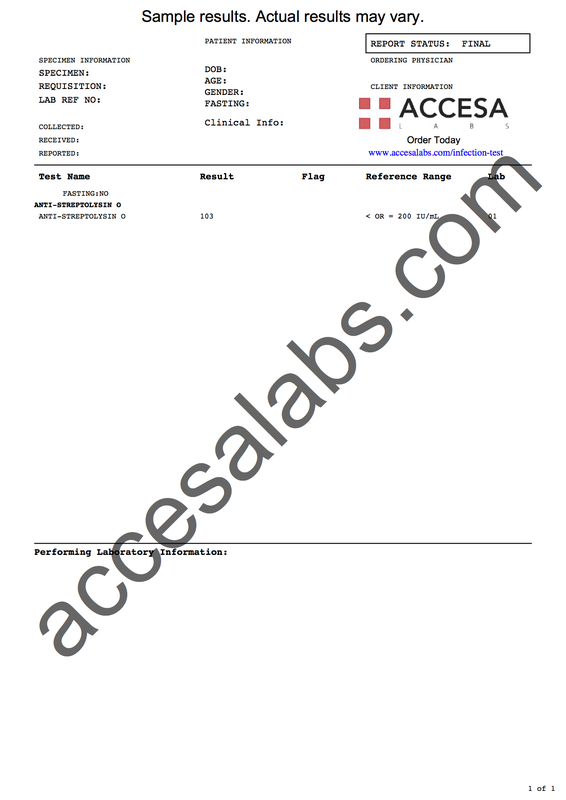 As can be seen on the sample ASO lab report above, the anti-streptolysin O blood levels will be reported as a number and can be compared against the reference range provided by the lab. No fasting is necessary prior to getting this ASO titer lab test. ASO Blood Test at Guaranteed Prices.